There is no getting between Pinky and her photo opp… There just isn’t. lol… if she gets struck down, she will become more powerful than you could ever imagine… I had to throw a Star Wars reference in there… Just had to! One of Pinky’s top people was none other than Mr. George Clooney. I know what you’re thinking… That dude is so nice. While personally, I have never met George… (I know you can’t believe it, either can the stack of crap I need him to sign. Seriousy, It’s talking to me now… It’s saying… Mike, get us signed! 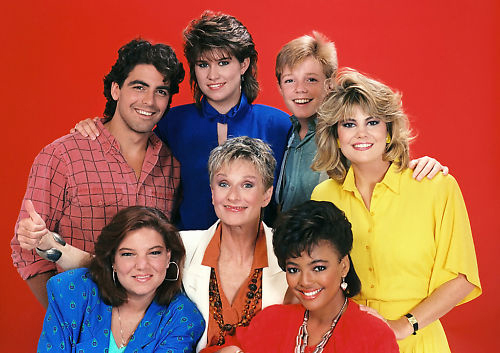 )… I am determined to meet him one day as he was “George” on The Facts of Life, and I will meet everyone from Facts… It’s going to happen. LOL… Check out Pinky’s George Clooney fails and finally success after the jump! Hello, my lovelies. Pinky Lovejoy here to tell you about finally meeting the one and only George Clooney. Yes, THE George Clooney (insert swoon here). Like many of you, I’ve been a fan of George’s from the very beginning. I enjoyed his work as George Burnett on The Facts of Life and could tell, even way back then, that he had a special quality about him. I couldn’t put my finger on it, but I knew he’d go far. 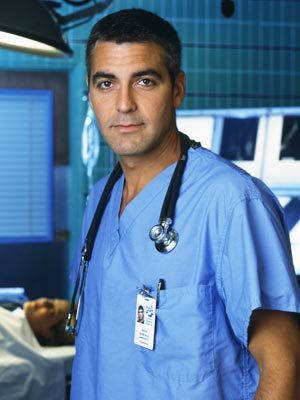 After his far-too-minor role as Booker Brooks on Roseanne, I loved him as Doctor Doug Ross on ER, and then, of course, as Danny Ocean in the Ocean’s Eleven films. 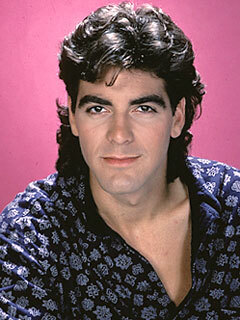 There was no denying it: George Clooney was hot stuff. He also just seemed really down-to-earth and cool. 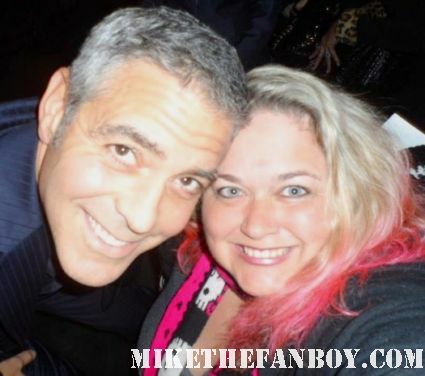 Now, meeting someone as amazing and incredible as George Clooney (can you tell that someone has a little crush?) is no easy feat. In fact, it took a series of failed attempts earlier this year before it finally came to be. I don’t know what it was, but every time I tried to meet him, something happened. 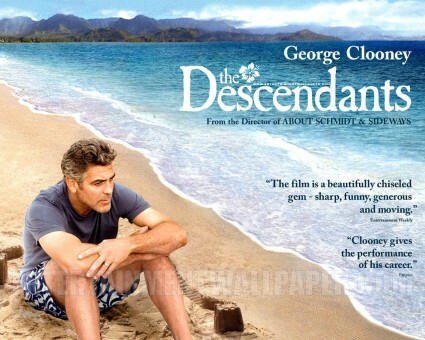 First, I went to a Q&A after a SAG screening of The Descendants (which I love love loved). Normally, it’s fairly easy to meet the cast at these little events. Not that night. Before we could even clap they whisked the cast off the stage. We never even saw them leave the theater; it was like they were magically beamed to the parking lot. Foiled! Next, I paid way too much money (but I’m sure it was for a good cause, right?) to attend a preview screening of The Ides of March at a benefit hoping that George (as the director) would be a part of the Q&A. Sadly, he never showed. His best friend and business partner was there, but not George. Curses! Finally, the very next day I went to the premiere of The Descendants. Not only was I the first one there, but I had a huge sign to boot. Although I’ve been told this isn’t like him, for whatever reason that day George never came over. They kept our fan barricade across the street, so he couldn’t even see us (or my sign). Fail! So, after striking out three times in a row, I was done with George for a bit. Still, I was determined to get a picture with George Clooney this year (actually, if you must know, during awards season my top goals were: Brad Pitt, George Clooney, Jean Dujardin, Michael Fassbender, and a better picture with Ryan Gosling. While I never saw Ryan or Michael, I did end up getting pictures with Brad, George, and Jean. Hooray! But, I digress. Back to the story). 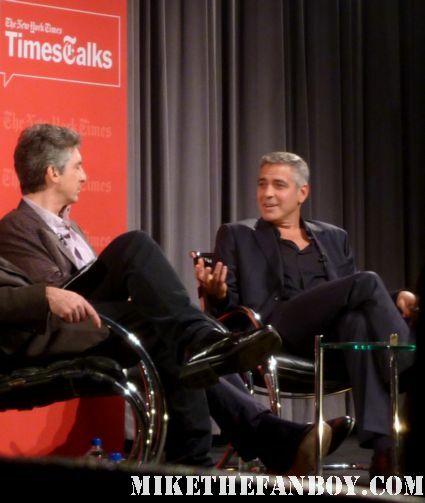 So, after my multitude of foiled attempts (seriously, I think I even missed a few in the there), like a rainbow coming out of the skies, I received notice of a “Times Talk” Q&A George would be doing in LA with Alexander Payne. I HAD TO GO!!! Although the event was sold out by the time I found out about it, I wasn’t giving up (I can be very stubborn when I’m determined to reach a goal). I scoured the internet to find a ticket and somehow ended up finding a guy who had two tickets and was happy to sell them to me. Success!!! I grabbed my girl Lindsay from www.iamnotastalker.com and headed out to meet George. But, I wasn’t taking any chances. I WAS GETTING THAT PICTURE! During lunch that day, I started crocheting a scarf for George. I continued to make it in the car on the way over, in line, and during the Q&A. I finished shortly before the Q&A was over (yes, I’m a bit of a crochet master, just so you know) and as soon as they were done, I jumped out of my seat and pretty much ran to the stage to give George his scarf and ask for a picture (hey, sometimes you’ve gotta make a run for it). George could not have been nicer. He was SO cool to me and Lindsay (who’d caught up to me by that time). He thanked me for the scarf and graciously posed for a picture with me and then for Lindsay. We were beyond excited by the end of the event and had to photo-document the moment with our “This is our George Clooney face” picture for Facebook (don’t judge us). It was a big deal!!! Operation George Clooney: (finally) SUCCESS!!! (Heads up – I’m coming for you next, Michael Fassbender…just sayin’). 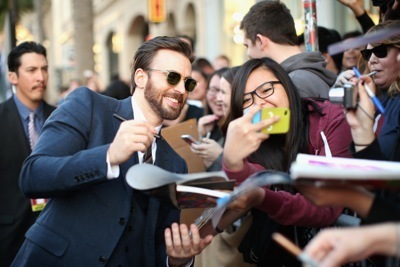 Captain America: The Winter Soldier Premiere Photos! Chris Evans! Scarlett Johansson! Sebastian Stan! And More! It’s 90210 Goodness! 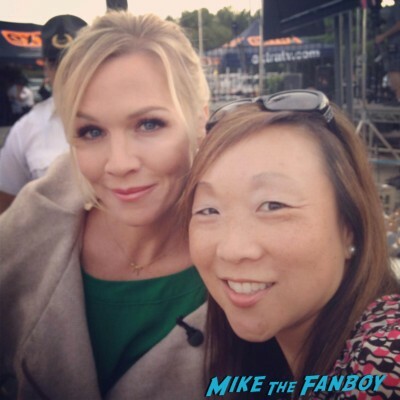 Karalee Gets Her Fangirl On After Meeting Jennie Garth! Plus Cameron Mathison! Dwayne Johnson or The Rock Makes CB’s Year by Signing his Fast Five Photos and More!